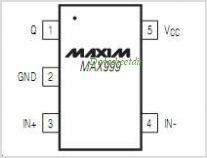 The MAX961 MAX963 MAX964 and MAX997 have a shutdown mode in which they consume only 270A supply current per Comparator The MAX961 MAX963 provide complementary outputs and a latch-enable feature. Latch enable allows the user to hold a valid Comparator output. The MAX999 is available in a tiny SOT23-5 package. The single MAX961 MAX997 and dual MAX962 are available in space-saving 8-pin MAX packages. This is one package pinout of MAX999,If you need more pinouts please download MAX999's pdf datasheet. MAX999 circuits will be updated soon..., now you can download the pdf datasheet to check the circuits!